Just the mention of pie classics such as apple pie, chicken pot pie, and even quiche, sets our taste buds into overdrive, but did you know that the first pies were often made from pastry that was intentionally barely edible, and had whole birds as fillings? Because the first pies of the Middle East and other classical civilizations were made from olive oil, the crust didn’t have the familiar flakiness and heft of the classic pie crusts that we know today. During Roman times (5th C. BC – 6th C. AD), and later in the Middle Ages in Europe, pastry was used as a method of keeping meats and other savory fillings moist during cooking, and also as a way in which to partially hermetically seal the filling in order to keep it from spoiling. The pastry, made from flour, suet (beef fat), eggs, and other ingredients, was dense and hard. Thus, only the filling would be eaten at the dining room table and the pastry topping would be left for the kitchen staff. The Oxford English Dictionary, in 1301, describes pie as “a baked dish of fruit, meat, fish, or vegetables, covered with pastry (or a similar substance) and frequently also having a base and sides of pastry. Also, a baked open pastry case filled with fruit…” Many believe the term “pie” has its beginnings from “magpie”, a bird that collects a variety of different objects, as European medieval pies usually had a variety of fillings in one pie, often a combination of several types of meat and fruits. As pies evolved in Europe, and then later in North America, pies with one primary ingredient became more common. In North America . . .
English colonists brought their recipes for pie with them to the New World. Other immigrants, such as the French, the Dutch, and the Scandinavians, also brought their pastry-making techniques and traditions with them to America. In the early years of our country, pie was a way in which to make precious ingredients last longer as pie crust used less flour than a loaf of bread, and could be filled with ingredients, such as dried apples, that could be kept over winter. But pie eventually also became a way in which to showcase local ingredients as well as a tribute to the immigrant’s homelands. Cream and cheese pies became popular in the northern Midwest, where dairy farms abounded; pecan pie became a staple in the South and Southwest where nut trees proliferated; fresh berry pies were a natural in the upper Midwest made by Scandinavian immigrants, and lime pie was the order of the day in Florida, where the famous key limes once grew plentifully. American pies started out with a suet or lard crust. Crisco, a popular brand of vegetable shortening, was invented in the United States in 1911 and vegetable shortening soon became the fat of choice for creating pie crusts, as lard went out of fashion. Butter, being quite a bit more expensive than vegetable shortening, was preferred for taste, but not for the shortness or tenderness of the crust it creates. The imagination of American pie bakers is virtually limitless. As American as Apple Pie . . .
Pumpkin pie, an American Thanksgiving staple, originated from English recipes for “tartstuff”, made from boiled and spiced fruit. Contrary to popular belief, pumpkin pie was not served at the first Pilgrim Thanksgiving, and did not become common at our Thanksgiving tables until the early 1800s. Pumpkin pie today is often made with sweetened condensed milk, but old-fashioned recipes for the pie use a custard base to which pureed pumpkin is added. Pumpkin pie may be an American Thanksgiving tradition, but few foods evoke Americana more than the American apple pie. Interestingly, apples are not native to America and they had to be imported originally from Europe. As the US became the world’s most productive apple-growing country, apple pies grew in popularity and eventually came to epitomize an American way of life. 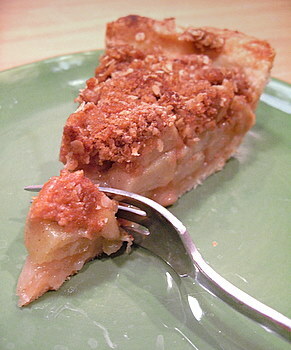 A few theories abound as to the popularity of apple pie in the US, especially given the creation of other types of sweet pies. One of the more colorful theories implicates teetotalers from the colonial era when apples were grown for hard cider. As the temperance movement took hold at the turn of the last century, a new use for apples had to be found, and apple-based desserts gained in popularity. The phrase “As American as Apple pie” is thought to have been invented by Abraham Lincoln during the Civil War. From the earliest history of pie, the pastry has been filled with savory fare, from mutton to beef, from fish to porpoise (yes, porpoise – it was considered a fish and therefore acceptable to eat on Fridays in Catholic Europe), and in this country, from chicken to cheese. Savory pies (filled with savory ingredients such as meat, rather than sweet ingredients such as fruit) are generally called “pot pies” in the US. Like sweet pies, savory pies also reflect the local surroundings of the countries and regions from which they came. Quiche is a French term which originally comes from the Lorraine region of France, meaning a savory pie filled with egg and cream. Current quiche Lorraine recipes usually contain egg, cheese, cream, and bacon or ham. Quiche came into vogue in the US in the 1980s, as chefs began to use quiche as a method of highlighting various ingredients. Shepherd’s pie, another common savory pie, is traditionally made with lamb or mutton (hence the name, “shepherd’s pie”) and is topped with mashed potatoes in lieu of a top pie crust. The dish originated in the early 19th Century in northern England or Scotland, where sheep were plentiful. Cottage pie is similar to Shepherd’s pie, but is usually made with beef instead of lamb or mutton. Mincemeat pie, now a meatless staple of the Thanksgiving dessert table, once contained – you guessed it – minced meat (usually beef), along with beef fat (suet), candied citrus peels, apples, and various spices. According to the 1876 Ohio cookbook, The Oxford Companion to Food, mince pies came into “disrepute” because their preparation was usually left up to servants who were unable to prepare the rather complicated pie properly. The same cookbook says: “Tact, wisdom, judgment, knowledge, and experience all go into the proper construction of a genuine mince pie, to say nothing of kindness of heart and liberality of disposition.” American cooks clearly have always taken their pie baking seriously! Chicken pot pie, another North American savory pie favorite, is usually filled with a cream-and-chicken based mixture, and topped with a savory pastry crust. The chicken pot pie was the first frozen pot pie available in the US, developed by the Swanson company in 1951 (and as the saying goes, the rest is history for TV dinners and frozen convenience foods.). Other common American savory pies include pork pie (a specialty of southern Massachusetts) and beef pot pie, which generally contains a mixture of beef and vegetables, and is similar to cottage pie, but, like chicken pot pie, is topped with a savory pastry crust. Amelia Simmons’ 1796 cookbook, American Cookery, lists other savory pies that have since fallen out of fashion, such as tongue pie, a savory-sweet concoction made with ox tongue, apples, and sugar; grass-fed ox foot pie; and something called a “sea pie” made with pigeons, veal, and pork (gee, I can’t imagine why these aren’t on our top 10 list). The end of pie as we know it . . . The diminishment of pie’s place in America seems to also coincide with the move from rural to urban environments as the Industrial Revolution took hold in North America. The holdouts of pie baking stayed with farm wives, where pie remained a way in which to showcase local ingredients, as well as techniques of pie cookery. Many farm wives competed (and still do) in pie bake-offs at County and State fairs and other agricultural showcases. “Homemade” pies will never leave the American dessert table. Although the “completely from scratch” baking of earlier generations is all but gone, the local grocery offers pie baking convenience options ranging from using a prepared crust but making your own filling, to purchasing a frozen pie ready for the oven. Regardless of the preparation, the end result is the same . . . a freshly baked pie hot out of the oven, ready to be served in a Slice of Life.